Posted on Fri, Feb 3, 2012 : 4:27 a.m. I've created a lot of dishes in my day, but to my palate, there are few things finer in life than salty-spiced-lip-smacking fried shellfish nestled under a blanket of horseradish coleslaw sandwiched in a (I'll repent tomorrow) plushy white roll. 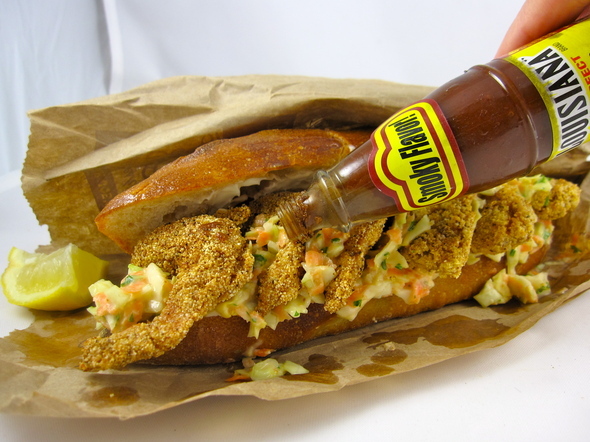 As we approach the Mardi-Gras, pre-Lenten season, cravings for Louisiana goodies such as this kick in. Dredge shrimp and oysters in corn meal. Last time I was visiting my family in Alabama, my brother, Allen, and I were debating whether to make shrimp or oyster Po' boys. Our recipe reconciles this angst giving us several big bites of both fried shrimp and oysters. We christened it the "Half-and-Half," not to be confused with another L.A. (lower Alabama) Half-and Half favorite: Black-Eyed Peas and Turnip Greens. Fry in oil that temps around 355 degrees. In Louisiana, the cole slaw used in these sandwiches is mayonnaise-based and is more sweet than tart. My recipe for Po’boy Horseradish Coleslaw is delicious with the oysters and shrimp, but you may purchase a pre-made coleslaw, to save time, adding horseradish to taste. 2. Combine cornmeal, seafood seasoning, 2 teaspoons salt and pepper. Taste blend and add salt to taste. 4. Dredge both sides of oysters in corn meal mix. 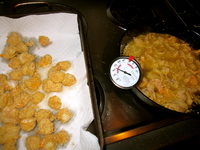 Gently drop in hot oil and fry oysters, in batches, until golden brown, 3-4 minutes on each side. Place oysters on a paper-towel lined baking sheet and place in warm oven. 5. Dredge shrimp in cornmeal mixture, dip in egg whites, then dredge again in cornmeal mixture. Fry shrimp in hot oil (355 degrees) until golden brown on each side. Place shrimp on a paper-towel lined baking sheet in the warm oven. 6. Slice bread horizontally, about 3/4 of the way through leaving one edge intact. Spread mayonnaise over both sides cut bread. Divide Po' Boy Horseradish Coleslaw over bottom pieces of bread. Top coleslaw with 4 fried oysters followed by 4 fried shrimp. Serve with hot sauce and lemon wedges. *Often seafood seasoning blends and fry mixes contain salt. Taste your final cornmeal blend and add salt to taste. Make a dressing by combining mayonnaise, vinegar, sugar and 2 teaspoons horseradish. Add diced cabbage, carrot and onion to dressing and combine, adding additional horseradish, kosher salt and freshly ground pepper to taste.